I’m the Community Manager at GDS and my role is to look at how we use our different social media channels. GDS is very active on social media. We use it to talk to people about what we’re doing - working in the open, to listen and engage with people online and to tell stories or publish content that would work better on these channels than in a blog post. Our Twitter and LinkedIn channels are reasonably well-established and the platforms are quite mature. Instagram, by contrast, is fast-growing . It hit one billion monthly users earlier this year. And new features such as Instagram TV offer lots of different opportunities for people to use it. I wanted to share with you a bit about how we use Instagram and why we do it. This is an obvious but very important point. The content on Instagram is predominantly photographs, graphics and video. This means that the types of things we post about tend to be visually led. On 21 June, content design colleagues from 65 departments and agencies will come together for #ConCon7. An event to share good practice, tackle shared challenges and find new ways to collaborate. ⠀⠀⠀⠀⠀⠀⠀⠀⠀ Here are a series of posters featuring quotes from content designers across government that highlight the value they add. And films about our events and projects - like this film about Sprint 18 from earlier this year. Last week at #Sprint18, we celebrated all the great things that teams across government have done so far to enable transformation. Visit the link in the bio to see more highlights from the day. We’re very fortunate to have an in-house creative team who work on photographs and films for us. You can see some of their work on our Flickr and YouTube accounts. But even if you do not have this resource, good content can come from anywhere. Alex Torrance, one of our designers, took this photo of one of his early sketches for GOV.UK. @alex_tea shares some early sketches of the GOV.UK homepage design #GOVUKis5 Five years on, we're continuing to make GOV.UK an exemplar in digital government globally. And while images are obviously very important on Instagram, do not forget the power of words too! It’s very important that each post has a clear and descriptive caption and we’re using the right hashtags to make sure our posts can be seen by as many people as possible who might be interested in them. 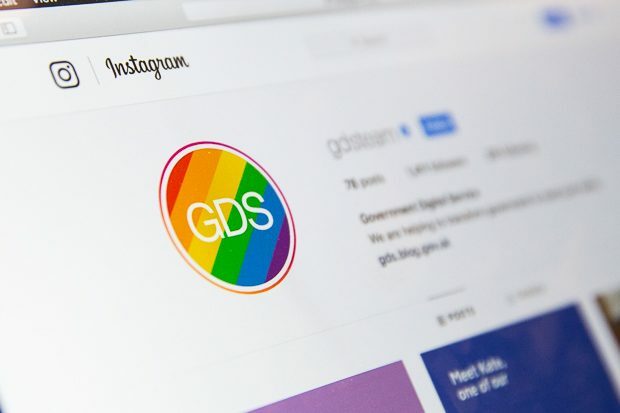 At GDS we organise and speak at a lot of events, and we find Instagram is a really useful channel to help us showcase these events. For example, it helps us to promote events we run, such as Sprint 18, and it also helps us showcase what we’ve done at them. On 10 May, we'll be sharing the best in digital government at #Sprint18. What to know what we've got in store? Kevin Cunnington outlines our 3 themes of transformation, collaboration and innovation in his latest blog - link in the bio! We often produce collateral for events and Instagram helps us shine a spotlight on them. Many of these posters and stickers can be downloaded from our Tumblr account and reused, so Instagram is a good way of showing people what’s available. We recently posted images of the posters we created for the International Design in Government conference. Last year we set up the International Design in Government community, consisting of government designers from around the world. Throughout the past 2 days, over 240 members of this group from 26 countries came together in London for the first International #GovDesign conference. A valuable way of bringing this community together to meet face-to-face, exchange ideas, create connections and find opportunities for collaboration. And Instagram also offers a great way for people to continue conversations after events or to revisit what was said. Hashtags, like #Sprint18, can gather together all the conversations around an event. With any channel you use, it’s worth thinking about what particular type of content suits it best. With Instagram we find we get a lot of engagement (likes and comments) on behind-the-scenes type posts. These show what day-to-day working is like at GDS or show the work that has gone into a project. Successful posts have highlighted internal events that we’ve held such as a BAME Network lunch. Food can be such an important marker of inclusion. That's why for #BlackHistoryMonth GDS BAME Network ran a lunch market featuring food from around the world. Here are the organisers, Samantha Bryant, Race Champion Coordinator, and Daniel Sintim, Early Talent Recruiter, manning the stall and (extra large) portion sizes. It's all about active listening. In our new offices we have walls you can write on. Here's a wall drawing left behind after a meeting. This is the type of content that might not work quite as well on Twitter or might not be substantial enough to write a whole blog post about. But for a short, visual post on Instagram it’s perfect. I’ve talked about how we can use Instagram as a standalone channel, but it’s also really important to think about how it links to your other channels. Just like our blog posts or any other form of communications, Instagram posts are often just one part of a bigger, multi-channel campaign. For example, when GOV.UK marked its fifth birthday last year we ran Instagram posts alongside lots of other content such as Tweets and blog posts. There were also articles in the press. If you’re running multichannel campaigns it’s important to think about what content you’re using where and also the hashtags you’re using in each place. With Twitter there are obvious restrictions on the number of hashtags you can use because of the word count, but on Instagram there is opportunity to use more. We used quite a few to talk about Sprint 18. #Sprint18 is tomorrow. A time to celebrate all the great work that has been done to transform government so far - and to look at what we'll be doing next. Swipe 👉 to see who'll be joining us, and visit the link in the bio to find out more. Instagram - and in particular the Instagram Stories feature - gives you the chance to talk to your audience and for them to talk to you. 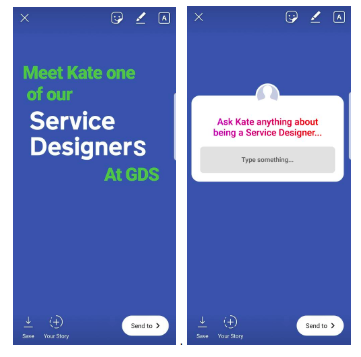 We’re currently using Instagram Stories to host a series of conversations about what it’s like to work at GDS. The people taking part in this are service designer Kate Ivey-Williams, technical architect Maisie Fernandes and senior developer Ruben Arakelyan. Anyone on Instagram can ask questions about their work and they'll then take to Instagram Stories to record a short film answering them. Readers can ask our team questions to find out more about their role. You can follow this series on the GDS Instagram page. Thanks for sharing your thoughts. The poster from the International Design in Government Conference reflects how this community identifies. The team had a lot of back and forth about the poster; ultimately we decided to keep it as is. We have community members who are designers in the devolved governments: Wales and Scotland, various local authorities in England, and those working for the UK Government. So we are reflecting our community and their identities.